Before the trial even starts, prepare beforehand! This is essential in order to get the most out of your trial, as well as will ensure for a smooth appointment, instead of forgetting many important details you wanted to discuss. Come with questions already in your mind. I understand that sometimes you might not know what you want to ask until the process gets going (and part of my job is knowing the right questions to ask), but you should try to come up with at least 3 important questions that you want to discuss. Whether it’s about your look or logistics, your trial is a great time to chat over these things in person. Secondly, have any pictures that you want to reference ready to go. Sometimes having an actual visual is better than trying to explain your vision. For example, your definition of a smoky eye might be different than your bridal artist’s, and therefore having some sort of image that accurately describes what you mean, will help you get most out of your appointment (rather spending 20 minutes trying to explain what you mean by a “natural rainbow look”). And finally, don’t be afraid to take notes at your trial. Many emotions are going to accompany your appointment (stress, excitement, etc.) and you don’t want to let those feelings get in the way of your focus. If your stylist says something you think is important, there is nothing wrong with making a quick note of it in your phone, rather than trying to remember every detail by yourself. This may sound kind of obvious, but make sure that you genuinely like your stylist. Throughout the trial, it might be easy to get caught up in the excitement of it all, and not acknowledge how well you are getting along with your artist. Remember that you are going to be spending a lot of time with this person during one of the most important days of your life. It is one thing to trust their skills, but make sure you actually like them as well. 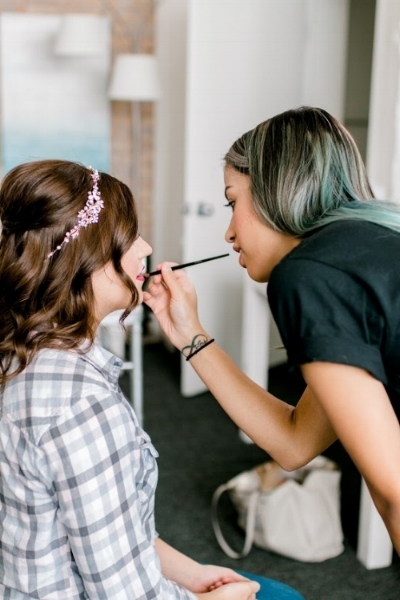 As a stylist that does a lot of weddings, I am always aware of this important component. Therefore, I always do my best to make my brides/bridal parties feel as comfortable as I can, while making a genuine effort to build a solid connection with them! Take pictures of everything! The one thing you don’t want after your trial is to forget what everything looked like. Not only will it help you remember what everything looks like, but it will also allow friends and family to have something to reference before the big day as well. You will also be able to see your hair and makeup in photos, which you want to ensure you’ll look just as good in real life as you do in pictures! Maybe your best friend wants to see what your hair will look like, or you just want to brag about how amazing your makeup is going to be to your sister. Whatever the case, having a picture to send them will help make that a reality. Additionally, planning a wedding is stressful enough, and many brides tend to second guess themselves on decisions they’ve made as the wedding gets closer. Having pictures from your trial will allow you to go back and remind yourself that getting an updo was the right choice, and that your lipstick will be the perfect shade of pink. I’m all for tips that help relax my brides, and this is definitely one of them! We’ve all sat in the salon chair, and watched ourselves get a horrible haircut without saying a word. Then after coming home (and crying for 5 hours) we immediately learned our lesson, and ultimately vowed to never make that mistake again. Well, the same concept goes for you bridal trial. Speak up, and be honest about what you do or don’t like! I know sometimes it can be scary in the moment to speak your mind, but just remember: YOU are the one that must live with your wedding photos forever, so if you don’t like what your stylist is doing, be honest. Obviously be kind and constructive when interjecting, but always remember that communicating your concerns (or your praises) during the trial is extremely important! If you’re interested in booking a bridal trial with me for your upcoming wedding, feel free to book a time here, or take a look at some more information below!